On my same hike up Claremont Canyon I passed excellent outcrops of the Orinda Formation. This is a sequence of coarse-grained, fluvial gravel that dates from about 12 million years ago, the late Miocene Epoch. 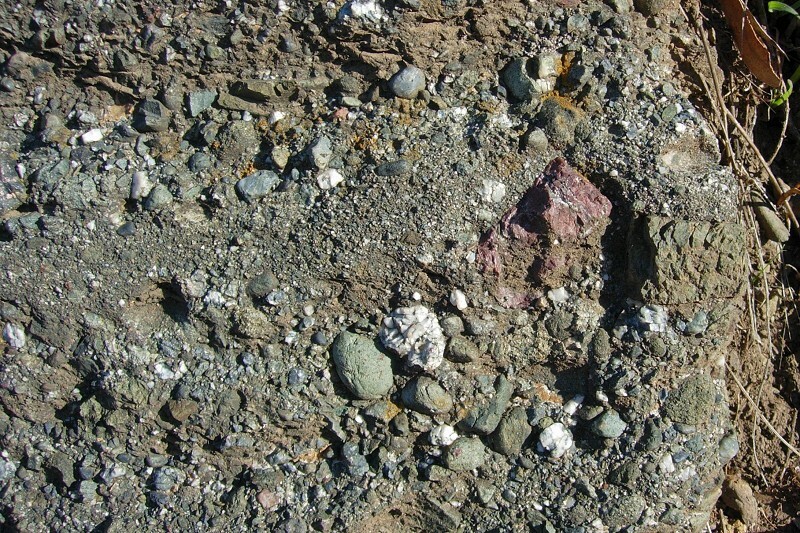 The rocks in the conglomerate come largely from Franciscan sources to the west, places that today are in Marin and Sonoma counties, on the other side of the Hayward fault. There must have been high, rocky hills of the stuff, and vigorous streams that tumbled and rounded this gravelly sediment as they carried it into a freshwater lake. Shortly afterward (shortly in geologic times, that is), volcanoes burst up as faulting broke the crust and covered all this with flows of basalt lava, the Moraga Formation. Only a few microfossils occur in this unit. See more photos of the Orinda and Moraga formations from the spectacular Route 24 exposure here. This entry was posted on 1 March 2008 at 5:00 pm and is filed under Oakland conglomerate. You can follow any responses to this entry through the RSS 2.0 feed. You can leave a response, or trackback from your own site.